Patients with autoimmune rheumatic disease are at increased risk of infection after surgery. The goal of this manuscript is to review current evidence on important contributors to infection risk in these patients and the optimal management of immunosuppression in the perioperative setting. 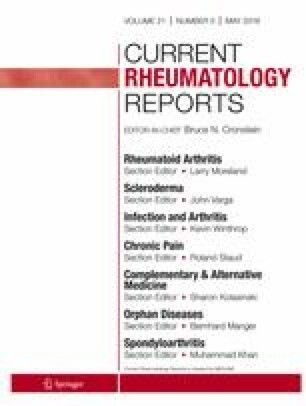 Recent studies have confirmed that patients with autoimmune rheumatic disease, including rheumatoid arthritis (RA) and systemic lupus erythematosus (SLE), are at increased risk of infection after surgery, with most evidence coming from studies of joint replacement surgery. Immunosuppression, disease activity, comorbidities, demographics, and surgeon and hospital volume are all important contributors to post-operative infection risk. Recently published guidelines regarding immunosuppression management before joint replacement recommend continuing the conventional disease-modifying drugs used to treat RA (e.g., methotrexate) without interruption, holding more potent conventional therapies for 1 week unless the underlying disease is severe, and holding biologic therapies for one dosing interval before surgery. Recent observational data suggests that holding biologics may not have a substantial impact on infection risk. These data also implicate glucocorticoids as a major contributor to post-operative infection risk. Observational data supports recent recommendations to continue many therapies in the perioperative period with only short interruptions of biologics and other potent immunosuppression. Even brief interruptions may not significantly lower risk, although the field continues to evolve. Clinicians should also consider other risk factors and should focus on minimizing glucocorticoids before surgery when possible to limit the risk of post-operative infection. Michael George is supported by the Rheumatology Research Foundation Scientist Development Award and the National Institute of Arthritis and Musculoskeletal and Skin Diseases K23-AR073931-01. Joshua Baker has been supported by a VA Clinical Science Research & Development Career Development Award (IK2 CX000955) and Merit Award (I01 CX001703). The contents of this work do not represent the views of the Department of the Veterans Affairs or the US Government. Dr. Michael George reports consultancy for AbbVie and grants from Bristol-Myers Squibb. Dr. Joshua Baker reports consultancy for Bristol-Myers Squibb and expert testimony for Burns White LLC. Michael George has received a research grant from Bristol-Myers Squibb and consulting fees < $10,000 from AbbVie. Joshua Baker has received consulting fees < $10,000 from Bristol-Myers Squibb.